Navage Nasal Irrigation Review 2018 and Tested – Does it Really Work? Do you want to clear your sinuses without medications? Check out Naväge. This handheld nasal irrigator is the first of its kind. It incorporates suction to help clear the nasal passages effectively. The company's patented system eliminates the need to measure ingredients and cleanup is a breeze. You could see the presentation of the Navage at Commercial TV. How Does Navage Nose Cleaner Work? 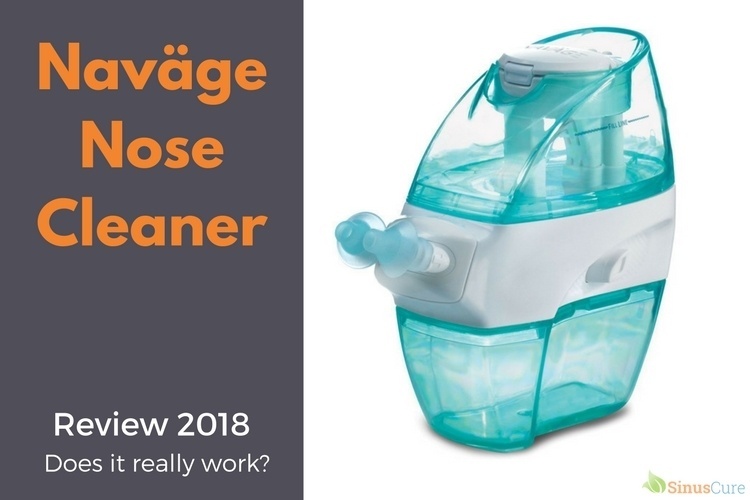 How Is the Nav﻿﻿﻿﻿ä﻿﻿﻿﻿ge Nose Cleaner Different from Its Competitors? Why Is It Better Than a Neti Pot? Naväge's creator suffered from recurring sinusitis and was looking for a way to reduce the discomfort of sinusitis and decrease the number of sinus infections. He found that a neti pot irrigated the sinuses and relieved the symptoms associated with sinusitis. Neti pot really work. As he was using a neti pot, he decided that it would be more comfortable and convenient if the saline solution were pulled through the sinus passage rather than being pushed through the sinus passage the way a neti pot does. The Naväge Nasal Hygiene System uses saline pods, which means no mixing or measuring. The system has two nostril plugs. One nostril plug pushes the saline into the nostril and the other nostril plug gently pulls the liquid through your sinus cavity. His idea of using suction instead of pressure is a different concept than traditional a neti pot. This technique is efficient, convenient and comfortable. Instead of the saline being pushed through the nasal cavities, the saline is pulled through the sinuses using gentle suction. The main principle is to utilize suction power not pressure; use a nose vacuum, not a broom! The company which produces this product is in the USA, Cleveland, Ohio. Although first launched in Canada. The Naväge nasal washer does require setup; however, once the batteries are installed, and the salt body is fitted, it is ready to use. How Is the Naväge Nose Cleaner Different from Its Competitors? The competitors to the Naväge include nasal squeeze bottles and neti pots. To use a nasal squeeze bottle, the tip is placed into the nose, and the bottle is squeezed. With a neti pot, the tip is positioned in the nose, and the pot is tipped upward. Both of these use pressure to push the saline solution into the sinuses. 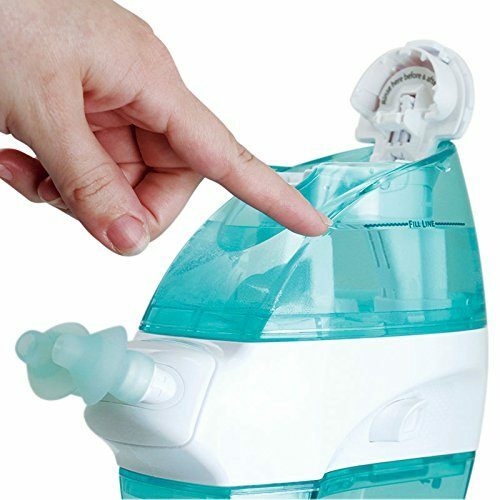 The Navage nose cleaner machine, on the other hand, uses gentle suction to irrigate the nasal passages. This system helps to flush pollen, pollution, dust and other microscopic particles from the nasal cavity. The beautiful thing about this nasal suction machine is that both nasal passages are closed. The solution cannot leak out of the nose instead of traveling through the sinus cavity. Neti pots are messy, and the saline solution often travels down the throat if the head is not held at a particular angle. If the solution goes down the throat, it can be really disgusting. With the Navage, you do not need to worry about holding your head at a particular angle or leaning over the sink. The saline solution enters one nostril and is sucked out of the other nostril. The solution that is sucked from the sinus cavity is held in the system's tank. With a neti pot, even after tilting the head in at a particular angle, users may experience water running from the sinus cavity for hours. With the Navage nasal cleaner, most of the water is sucked from the sinus cavity. Then, a gentle nose blow ensures all excess moisture is removed from the sinus cavities. We can say that Navage is an essentially electric neti pot of the 21st century! Sensations from cleaning process are difficult to describe. First, nasal pillows are inserted into the nostrils. Then the button is pressed halfway to create a vacuum effect. Many say this sensation is uncomfortable. 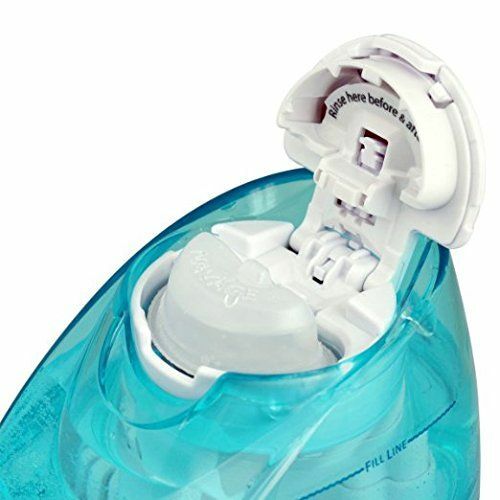 Once you become accustomed to the sucking sensation, you will press the button all the way in so the salt water flows out of the container and into one nostril. The suction pulls the saline solution through the sinus cavity and stores it into the lower tank. The entire process only takes 15 to 20 seconds. You will be able to breathe through your mouth while the sinuses are cleaned; however, avoid talking as talking can cause the saline solution to drain down the back of the throat. You must keep your mouth closed when you first begin the process. Once the water starts to flow through the sinuses, you can open your mouth and breath normally. Right before the end of the process, you will need to close your mouth to ensure that all the solution is removed from the sinuses. To complete the process, only blow your nose to ensure all remnants of the saline solution is out of the sinus cavities. Some people say the sensation is similar to swallowing a small amount of pool water. Other than that, most people report that the effect of the Navage Nasal Hygiene System is rather pleasant. PRO Tip! You must ensure the correct amount of water is used. Completely fill the Naväge with water (236 milliliters) to ensure the saline is properly diluted. If not enough water is used, the solution can cause burning and discomfort in the nasal cavity. Therefore, it is essential that you completely fill the unit with water. So What Is the Result? Does It Really Work? After the first use, you will feel relief and will be able to breathe easier. This system clears the sinuses and relieves sinus pressure. The Navage system is easy to use and will make you breathe easier and reduce any congestion or pressure in the nasal cavities. This nose cleaner machine is accurately doing its job. Although a neti pot is great, the suction of the Navage nasal irrigation really clears out the sinuses. Because the system cleanses both nostrils at once, you do not need to switch to the other nostril. In 20 seconds, your entire sinus passage will be cleaned and cleared. Most users report that their sinus headaches are completely relieved, and their sense of smell is restored. Finally, those who have been using addictive nasal sprays can stop using them immediately. 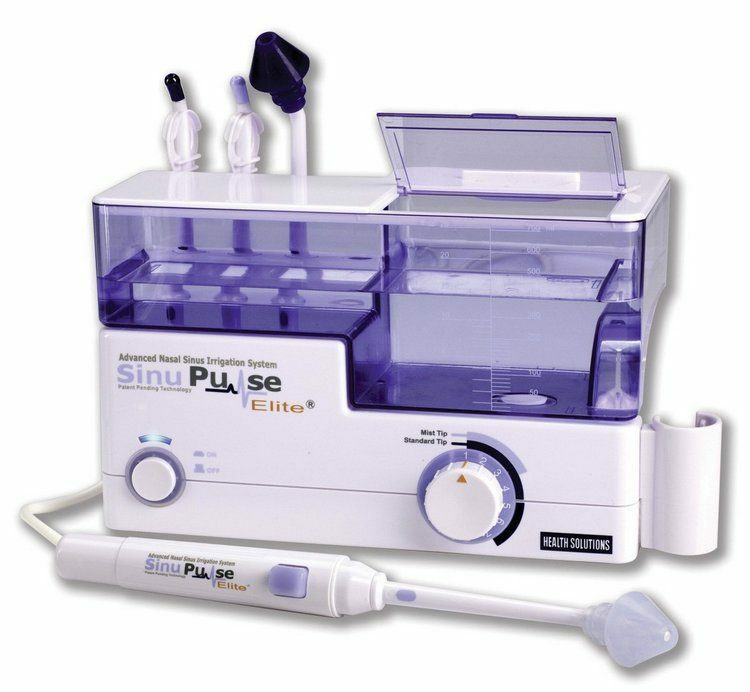 This sinus cleanser machine should be used two times a day; however, you can use the nasal cleaner as much or vice versa as little as you want. 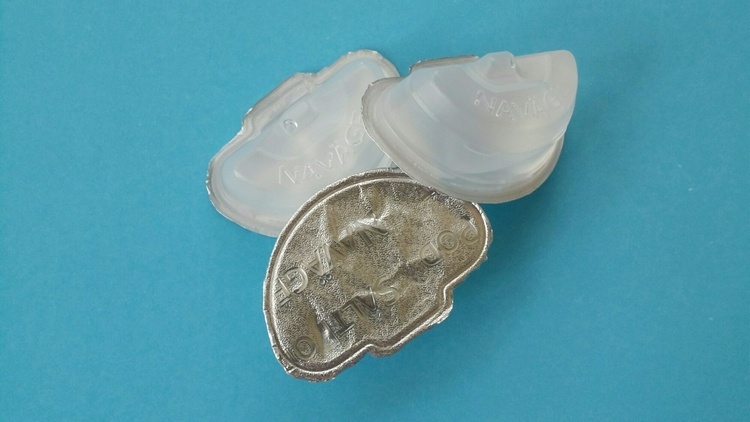 In order to use the Navage, you will need to purchase saline pods. These pods are about 50 cents each. Each time you use the system, a new pod must be installed. The unit will not work until a new pod is inserted. In order to function, a new Salt Pod capsule will need to be installed. The cost of these Salt Pods should be taken into consideration when determining if this system is right for you. Although some resourceful users can work around this limitation. The salt pods are made using the pure sea salt and purified water. The sea salt does not have any fillers or additives, and the water is purified to ensure purity. The manufacturer guarantees it is 99.99% sodium chloride. The salt pods ensure that the salt to water ratio is correct. It offers a superior the best mixture of the saline solution. This means it will not burn the way a neti pot often does. In our opinion, the main alternative to Navage is SinuPulse Elite. The main differences of Sinupulse, is that it uses pulsating irrigation, instead of the suction. Sinupulse is not portable - it works from the electrical grid, and it is necessary to conduct the procedure at the sink. But it has two modes cleanse sinuses and bonus - you can cleanse your tonsil and tongue. More about Sinupulse read in our review here. Of course, you need to consult your doctor before using this nasal suction machine. But if you have sinus problems or other nasal congestion, you have to give Navage a chance and try it out. And it really will bring you relief. ​It's cleans both sides of the nasal passage. ​Easy to remove the tank and clean. ​Perfect mixture of salt water with purest sea salt. 30-day satisfaction guarantee and comes with a 1-year limited warranty. The unpleasant sensation when you first use to which you will have to adapt. Just a little more efficient than a neti pot. But the difference is not significant. 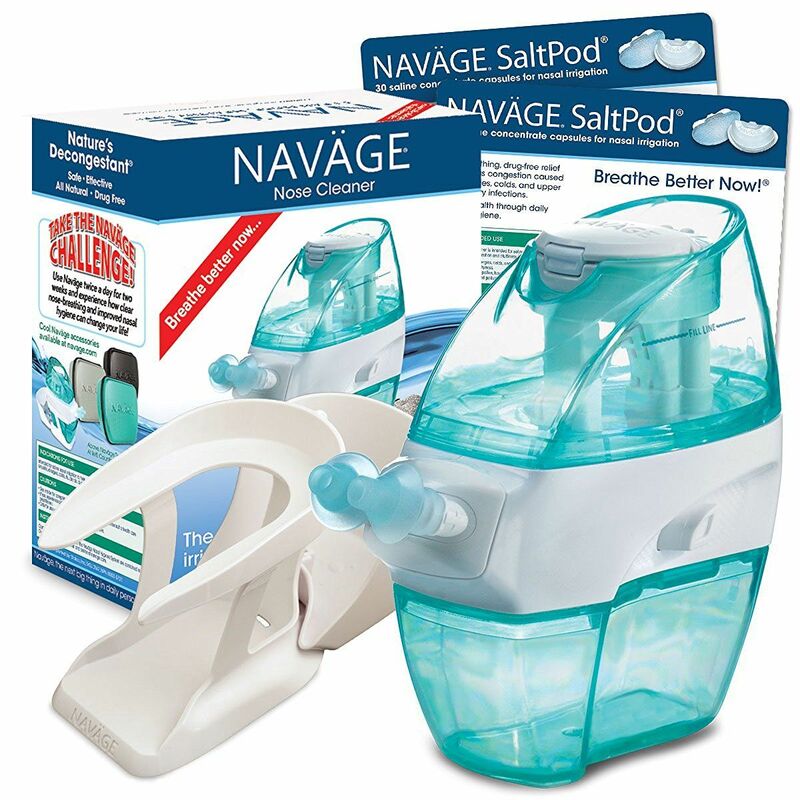 You have to buy branded SaltPods from Navage. SinuPulse Elite Review 2018-The Best System for Nasal Irrigation? I really like it. I had a 40% off coupon at cvs so I bought it there pretty cheap. I have been using it twice a day for about 3 weeks and it clears me up so I can finally breathe through my nose. Yes it does work awesomely! And I suffer from chronic sinusitis. I just got the system, I have been suffering from Nose bleeds and sinus infections so I thought I would try it out. At first it was in comfortable but the weird feeling was worth it. It cleaned me out and now I am breathing much better I will definitely continue using it. I tried the Navarre but the solution came pouring out of my mouth and nothing in the bottom reserve of the unit. What am I doing wrong? Navage reviews have a 65% fake review rating with Fakespot went with the the pulsating irrigator looks more real and was reimbursable by my insurance. I just returned the first one I bought because it didn’t work. I can’t get the new one to work either. When I try to push the button nothing happens. I just fiend $90 on this. I am not happy at all. You need salt tablets I’ve been using saline nasal spray prn. It’s not in my budget to buy something that needs salt tablets.